The District of Columbia Fire Department was officially organized on September 23, 1871, although several neighborhoods had volunteer and paid crews prior to that date. These began with a fund raiser held in 1789 to purchase a hand pumping engine and buckets for the Georgetown community. Fire Station No. 4 at 931 R Street, NW was built between 1884 and 1885, and later became notable as an all-black engine company. The first firefighter in the District to lose his life in the line of duty occurred on May 6, 1856, when Benjamin Grenup, a member of the Columbia Engine Company, fell from a vehicle on the way to fighting a fire at the Shreeves’ Stables on capitol Hill. His grave in Glenwood Cemetery is marked with life sized fire hydrants carved in stone at each corner of his plot. Regulations for the department were first introduced in September of 1856, and a short time later, Mott style fire call boxes were placed in strategic locations throughout the city, recognized by their harp shaped cast iron poles and gas lights. Citizens would pull a trigger at these locations to send a telegram like alarm to a central station, which noted a fire in progress near that particular pole. The call boxes cost an estimated $200 each to purchase, install, and wire. The Gamewell Company later expanded the system to include more than 1,500 such call boxes in the city, expanded to include police call boxes using a similar system. We did a blog post just on the callboxes themselves HERE. Records kept by the Fire Department were meticulous, as reported on a yearly basis in the Report of Commissioners of the District of Columbia. In 1880, for example, salaries totaled $71,840, and the Department had 15,600 feet of hose in good condition, 3,700 feet in fair condition, and 3,400 feed in bad condition. They had a total of 38 horses, of which 32 were in active condition. Each firehouse had an inventory of all items on the premises, down to the number of pliers and combs. Gas jets, chimneys, and gas stoves seem to have caused most of the fires reported in 1880. Fire Station No. 4 at 931 R Street became the first all-black fire fighting company in Washington on April 3, 1919. Prior to the forming of this company, the fire department had been racially integrated, but it was difficult for blacks to pass arbitrary and impromptu physicals and exams sprung by white leaders effectively preventing them from advancing ranks within the Department. The request for the all-black company was instituted by one of the four black firefighters working for the city at the time who apparently believed that his only opportunity for advancement was within an all-black unit. In January of 1943, Gordon Parks photographed the fire company at Station No. 4, recording their daily activities and routines, seen here. He included pictures of Lt. Mills and Captain J.B. Keyes, and other crew members. Parks followed them to calls and fires, including one in front of the Mid-City Theater in the 1200 block of 7th Street, built in 1913. The Department was integrated again in the early 1960s, but advancement for blacks remained difficult, often conflicting with a multiple generation immigrant population. Following the 1968 riots, however, an aggressive recruiting campaign resulted in a more racially balanced department. Washington, DC had its first black fire chief appointed in 1973. Fire Station No. 4 was later changed to Fire Station No. 7, but is today a private artist studio and residence. 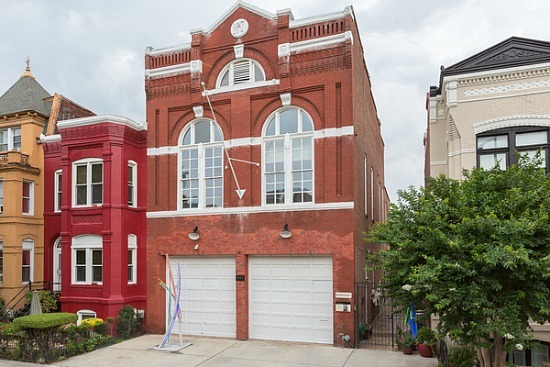 As reported by Urban Turf, it can be yours for just $2.65 million. See the listing HERE. Neat to know this was and Afro-American firehouse. Excellent post. You may be interested in this post about one of the last firehorses in DC..